A scooter need not only to be a scooter, but it should also be the best scooter. It should be worth your money! When going out to shop or buy a scooter for yourself or for your young ones, it is important that you know what to expect in the market to ensure that you are ready and you buy the best device. We give you this detailed review on Razor E100 Motorized 24-Volt Electric Rechargeable Scooter to show you the unique features of this scooter and to also show you why this is the next big thing on the market! 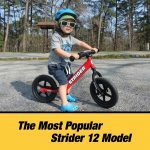 If you are looking for a present or gift to buy for your kid, then Razor E100 Motorized Electric Rechargeable scooter is what you should consider! It has been designed for use by young kids and it is an ideal gift for anyone from five years to fifteen years of age. It can attain speeds of up to ten miles per hour. This together with its unique features and designs make your kid the envy of your neighborhood! 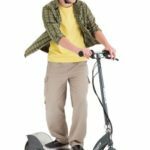 Pneumatic tires– Razor E100 Motorized Electric scooter is equipped with high-quality pneumatic tires that are eight inches in size. The pneumatic tires are of very high quality and hence very durable. The pneumatic tires also provide a smooth ride for the user and hence it is very enjoyable to ride on this scooter. Hand brakes– Razor E100 Motorized Electric scooter has been equipped with hand brakes that are operated from the front. This is a unique feature that allows you to easily stop your scooter whenever the need arises. It is a very important feature as your scooter can be stopped instantly especially on emergencies. This means that it is very easy to avoid accidents as you decide where and when to stop. High torque and effective chain controlled motor– Razor E100 Electric scooter is equipped with a very high torque and effective chain controlled motor which is very quiet as it does not produce a lot of noise. This means that you can comfortably ride your scooter in any neighborhood without the fear of disturbing your neighbors. It is, therefore, an environmental friendly scooter in terms of noise pollution and this means that you ride your scooter at peace without exposing yourself to dangers related to very loud noises. Twist grip throttle for acceleration purposes– Twist grip control is another unique feature that you will find on the Razor E100 Electric Scooter. The twist grip throttle control allows you to accelerate the speed of this scooter as you ride along. It is very easy to control this as you just use your hand. This makes it very easy to learn how to operate this gadget and hence saves you a lot of time on prolonged training sessions which are not only time consuming but could also be expensive as you pay an expert to train you. Long battery life– The Razor E100 Best Electric Scooter has rechargeable batteries that have a very long usage life. This means that you take a very long period of time before replacing or repairing the batteries as they are of very high quality. This has a long run effect of lowering the maintenance cost of this gadget which makes the Razor E100 Electric scooter a very economical gadget to use. Powerful- Razor E100 is a relatively very powerful scooter as compared to some other scooters. This scooter can cover up to ten miles in a duration of one hour hence making it one of the few reliable scooters when it comes to speed and movement. Rechargeable system– Razor E100 Electric Scooter has a rechargeable and long-lasting battery system that allows you to recharge your scooter when it runs out of battery. The batteries are also very strong and can run up to forty minutes of continuous usage without needing a recharge. This means that you can actually fully rely on this gadget and you don’t have to worry about running out of battery. Suitable for kids– Unlike many other scooters in the market, Razor E100 Motorized scooter is made with the thought of your young kids in mind. With a kid-sized deck and a stable frame, this scooter provides an awesome ride for young kids who love adventure, trying new things and who love to spend their time in the neighborhood, showing their expertise riding this scooter. Saves time– This scooter is very time conscious and takes very short time to recharge. This saves you a lot of time as you don’t need to spend the whole day trying to charge your scooter. This means that, you get quality and enough time to ride your scooter around or travelling. No charge worries– This is one of the few Razor scooters that come with a battery rechargeable system. This means that, as long as you have enough power supply, then you should never worry about running out of charge as you can always recharge your scooter. The quality and long life batteries also ensure that you stay for very long periods of time without running out of charge. Environmental friendly– You don’t love getting into trouble with your neighbors? Then is the scooter to buy. It is equipped with a chain controlled motor that is very quiet and produces a very little amount of noise. This means that you don’t risk making noise for your neighbors who may not take that kindly. Brakes efficiency may rely on weight– The main shortcoming of this scooter is probably on its brake system. Although it works, the break of this Razor E100 Electric scooter heavily relies on the weight of the user. The more the weight, the less the efficiency. It is therefore very important to be careful when riding this scooter to ensure that you don’t only rely on the braking system. It is advisable that you stay clear of any barriers and walls on the way. 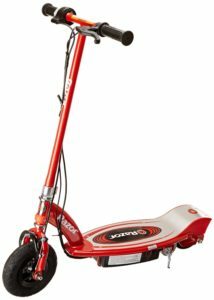 Although this type of scooter has some shortcomings, it is by far one of the top rated best scooters, especially for young kids. You should, however, guide your kids as they ride on this scooter until they are good enough to ride on their own. Similar Product you can also check details review.